Following the worldwide debut of "Today at Apple," Apple in July will launch this year's summer camps for kids at its retail stores, aimed at those between ages 8 and 12. The free "Apple Camp" will educate kids on how to create characters, make movies, design storybooks, code robots, and more while using Apple products (via Macworld). Apple Camp's workshops this year include Coding Games and Programming Robots, Creating Characters and Composing Music, and Stories in Motion with iMovie. Each workshop is designed as a series of three 90-minute classes that kids visit on three separate days. For the first two days kids will work on projects specific to the session they choose, while the final day will be a show and tell where they present their final project to parents, friends, and fellow Apple Campers. Creating Characters and Composing Music: Kids ages 8-12 will create their own stories through drawings and sounds. Campers will start their session by sketching characters and scenes with iPad Pro and Apple Pencil, then they’ll explore the basics for composing a track using GarageBand. They’ll bring their story to life by adding vocals and finishing touches. Stories in Motion with iMovie: Future filmmakers ages 8-12 will explore the creative process of turning their ideas into real movies. In this three-day session, Campers will learn how to brainstorm and storyboard. Then they’ll get hands-on with movie-making techniques like learning camera angles and editing with iMovie. On the final day, they’ll present their masterpieces. Apple Camp will begin July 10 and run through July 28, and registration is up now on Apple.com. Today at Apple also offers other kid-focused sessions called "Kids Hour," with more classes teaching coding as well as basic knowledge of GarageBand and iMovie. Following the worldwide debut of "Today at Apple," ('https://www.macrumors.com/2017/05/16/today-at-apple-classes-launch/') Apple in July will launch this year's summer camps for kids at its retail stores, aimed at those between ages 8 and 12. 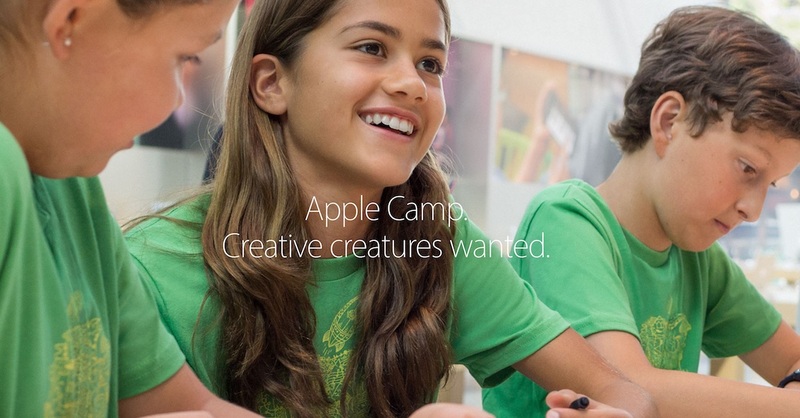 The free "Apple Camp ('https://concierge.apple.com/camp/choosestore/en_US')" will educate kids on how to create characters, make movies, design storybooks, code robots, and more while using Apple products (via Macworld ('http://www.macworld.com/article/3202065/application-development/apple-camp-kids-hour.html')). Apple Camp will begin July 10 and run through July 28, and registration is up now on Apple.com ('https://concierge.apple.com/camp/choosestore/en_US'). Today at Apple also offers other kid-focused sessions called "Kids Hour," with more classes teaching coding as well as basic knowledge of GarageBand and iMovie. As a design professional and a local children's film festival volunteer and advocate, this is a truly amazing opportunity for kids who crave creative outlets and a safe venue for self-expression. Kudos Apple. My oldest did the coding and iMovie last year and really enjoyed both. The iMovie class while basic, taught not only the software; but walked them through concept, storyboards, filming and editing so they got the whole process (and I learned a few things in the session I attended with him). It was a no brainer for us to sign our youngest up for coding and music this year. LOL, Riiiiight. Who doesn't want their kid listening to a bunch of underpaid teenage hipsters brainwashing your kids to beg you to buy them $1k iPad Pro's so they can "create"? Nice and elaborated way to encourage parents to empty their wallets through luring their kids into the "World of Apple Magic". One would question ethics of such approach though. Thanks for the heads up! I just signed up my son for all 3 at my local Apple Store. We're paying for coding camp for him the week before this at our local Sylvan Learning Center so this is terrific. Learning to code and create content are skills that enrich and open doors to future career paths. Apple should do this all year around as after school programs in my opinion.